If the user chooses the top option, the computer will restart. If the user chooses either of the latter two options, Windows will appear to boot, but end up on a blank, black desktop with no icons, and an error message that the Desktop file could not be accessed. Following, there’s the usual Reddit tirade about Avast, AVG, Win10, 1803, and the phase of the moon. But it sounds like they’re on to a real, live problem. I think Avast or AVG do not even deserve to be discussed. They were useful long time ago, but it is time for both of them to go. Unless using a reputable antivirus like McAfee, Windows Defender is perfectly acceptable. Even so, I am not convinced that McAfee’s superiority can be proved beyond artificial benchmarks. I’ve definitely read a lot of threads that indicate you need to disable your third party security suite before upgrading Windows. Even some suggesting you uninstall it before a upgrade. So many I think block certain files during upgrades that it corrupts it. I use Defender and occasional scans with Malwarebytes if I suspect a problem. I definitely think 1803 is a bit of a mess for sure and I reverted two of my older PC’s back to Windows 7. Though I am no fan of Avast or AVG, I happen to use several third party tools that make Windows 10 a little nicer to use, and every doggone new release breaks them. Sometimes the authors need almost 6 months to fix them to where they work again. 6 month cycles kill everyone’s productivity. Avast and AVG are rated higher than Windows Defender. They may be ranked higher than Windows Defender, but I wouldn’t consider them superior any longer. Especially their free editions which is where their largest install base comes from. Long ago in a time before millennials (in the work force), AVG/Avast! were the best free options available and generally were quite polite programs. Now they continuously advertise and install c**pware. If you want a free AV, ClamAV is the best choice, Malwarebytes is also good. If you want a security suite (which I recommend), then I’d go with ESET NOD32 or Kaspersky (if you trust the Russians, which I do). Both are great products that do their job without kneecapping the systems they’re on. On-Demand scans aren’t too useful any longer, NOD32 and other suites are good because they can do more. This has not happened to me (Kubuntu Linux with 10 LTSB in a VM when rarely needed) but, are you able to hit CTRL-ALT-Del open Task Manager then Run Explorer, Regedit, etc while at the BBDoD (Blank Black Desktop of Death)? If that is possible it should be possible to fix the issue if it is permissions, registry issues, drive mapping or get to system restore and roll back. It seems possible that avast! saw this coming and at least tried to warn somebody. At least for the business products, they don’t actually email anybody or anything. They just post something on their forums. I disabled Avast and Malwarebytes before I upgraded to 1803. No issues thus far. Win 7, Microsoft Security Essentials, ADW Cleaner. Happened Sunday to a friend using Avast. Tried for a few hours to repair it but gave up and reinstall it. The old folders including the user profile were only partially moved to the new installation ending up with a corrupted 1803 version. Just for info, if anyone wants to read more, the reddit article is long. The story is making the rounds. I saw a post the theregister.co.uk earlier today. So MS’ pre-alpha testing did catch this? Or did MS ignore it? … So MS’ pre-alpha testing did catch this? But reading the linked thread in Woody’s article, I see McAfee, Norton and other non-Avg/Avast users having same issue. Not for the first time Noel Carboni has hit the nail on the head of a topic once more – Microsoft’s six monthly roll out of ‘new’, all singing all dancing versions of Win 10 is a cadence guaranteed to break lots of third-party software. Not that MS is too bothered about that. But of course such a frantic ‘delivery timescale’ means non-Microsoft software isn’t the only thing guaranteed to break, is it? It means that each new Win 10 version itself is also guaranteed to be broken on release. The dizzying game of patching the patch to repair the patch or rolling back to versions of Win 10 that themselves still require patching will continue ad-infinitum. As will negotiating the stressful minefield of working out (thank goodness for Woody and contributors, by the way) which patches to install, when to install them or indeed, when to rip them back out. I shouldn’t need heather dangling from my USB stick and a rabbit’s-foot and horseshoe stuck on my case in order to encourage my ‘puter to work, either. But I think they will be needed until either I or Windows 10 expires. Now everyone does realize that if MSFT got everything out the chute right each time, every time, day in and day out, for everyone and it did exactly what everyone wanted it to do and everyone knew what it did and how & why it did it whatever “IT” is, there would be no need for AskWoody.com and we wouldn’t be here amongst ourselves trying to get to know one another while we’re all here working diligently & collectively figuring this s**t out. Therefore for the lifeblood of AskWoody.com, I say to MSFT … keep it up, we’ve got you covered, we’re more than capable of traveling the rocky, winding road you’ve sown upon us, and when we’ve completed the tasks you’ve bestowed, the world will be a much better & safer place running Linux or Mac OS, or Chrome OS or who knows maybe someday … AskWoody OS. My next machine will probably be a Chromebook. I’m doing almost all of my work these days with Firefox, Chrome, Google Suite, and various web sites. My son’s Chromebook works great — as do all of the other Chromebooks I know about. No security problems. Occasional hiccups but, man, compared to the constant bombardment that is Windows, it’s blissfully calm. We’ve come a long way from Windows 286, my original poison of choice. As long as these AVs are using documented Windows features to do what they do, I don’t think they should be blamed for what happens. Microsoft is the one constantly breaking stuff. I just don’t get how this methodology could remotely be profitable for Microsoft. This is all c*** that Microsoft is giving away for free, basically. If they focused on stability, there isn’t anyone who would not buy Windows because of lack of shiny. And there’s no reason they can’t have all the shiny abstracted away from the core, anyways, so that stuff doesn’t break. No other company does it this way, doing so badly. How does this help them in any way? As I think Noel mentioned in another thread, the idea of a constantly changing OS is to maintain excitement – what is coming next etc so theoretically pushing up market share. This is a very good point and would make a lot more sense (hopefully MS will consider this after the 1803 disaster). However, abstracted shiny might make it indistinguishable from 3rd party apps which would eventually dull the excitement MS is trying to drum up. The core-only-lack of shiny is provided by LTSB – if you are rich enough to afford Enterprise volume licensing and the added-on outrageous fees for LTSB. Another point that has been brought up elsewhere is that, if everyone is busy making changes to support Microsoft’s latest flavor-of-the-month, those are developers that aren’t developing software that competes with Microsoft. One of our customers had this happen to their laptop. AVG was present. Rolling back to the previous version failed with no error message more descriptive than “it didn’t work.” Moving C:\Program Files, C:\ProgramData, C:\Users, C:\Windows (etc.) into C:\Windows.bad, and moving C:\Windows.old\* into C:\ got me a somewhat usable system, but some things still got moved to the new system from the old system, so I’ve been cherry picking things from C:\Windows.bad to move back, i.e. the right Users\User\AppData was in what I moved into C:\Windows.bad, but documents and desktop icons were in Windows.old. Windows upgrades apparently touch user directories. I hear Windows.old gets periodically and automatically deleted. If that had happened, our poor customer would have lost all his documents and such. I’m switching to Linux at home, as of a few weeks ago. By the time my Windows 7 installation is out of support, I should have most of my two decades of Windows cruft migrated over. With any luck, I’ll never need to use Windows 10 for anything other than the occasional Windows-only game. You’re smart for making the switch now, rather than waiting till 7 is about to go out of support. Gives you plenty of time to successfully make the switch. I have written elsewhere in askwoody that I have recently switched an experimental Win10 desktop machine to become my experiment Linux Mint 18.3 Cinnamon machine (with Wine, because I have a lot of my own developed programs, for my own use, which I want to keep on with). I am happy with that move, and I am now trying to make sure that I can take proper backups and then restore them. Looking good so far, touch wood. Win10 will not see me again. The cashier in the shop selling backup disk drives said “you’ve bought a lot of these”, and I said “I have a lifetime’s work to backup — one program I still use originated on an IBM mainframe in 1971 and has gone through many generations since then, but I don’t want to lose it”. Since I’m anon, I want to thank, in this post, this poster, plus Mr. Jim Phelps in the preceding post: I have been severely frustrated, worried and irritated, by MS’s recent Win 7 x64 patches and re-patches; and their current lack of action on May’s KB4103712 NIC problems. Well…..I just saw and bought last week a brand-new 4 TB port. HDD/backup. I’ve done nothing with it yet. Hoped to use it for really complete backups. But THIS may now be the time for me to install on this Win7 x64 PC, on that backup, a Linux SuSE Leap or other distro, dual boot into Win 7 or Linux, and start NOW to make the switch, preparatory to Win 7 EOL next year. Thank you, folks, for your comments!!! Go to one of the Linux sites (e.g. http://www.linuxmint.com) and download one of the current .ISO files. Then create a Linux install DVD from the .ISO file. (The Linux install disk is also called a “Linux Live” disk.) Then boot to the disk you just created. This will put you into Linux Live. There is no need to actually install anything; you can run Linux straight off of the Linux Live disk, just to see what you think about it. To me this seems like a great opportunity on a spare/ old PC to at least try some out as per HMcF post. If you’re going to try Linux on an old PC, I highly recommend Elementary OS. It works very well on my old eMachines computer. Over the years, I’ve used several of the free anti-virus programs mentioned here & a few others including a few paid for programs & security suites & I found some to be good, some no-so good, and the rest so-so. Not sure if my security suite of choice would be effected by this Win10 v1803 bug but I use Symantec’s Endpoint Security (SEP) Enterprise. I’ve been using this security suite for several years now on all my systems without any issues what-so-ever. Well, there is one little issue that crops up … if you restore your system from a Windows Restore Point using System Restore, you’ll most likely need to repair the SEP installation via the control panel or you can just re-run the SEP install from it’s installation media. I believe this problem has to do with re-synchronization of SEP’s definition sets and the program’s SymEvent and/or LiveUpdate engines. This will be detected and reported by the SymDiag tool described below if you run it. I suspect this may occur with other 3rd party anti-virus/anti-malware/firewall programs that embed themselves deeply into the Window’s environment. Though Symantec & Norton were previously (maybe still are?) known for hogging up system resources and performance, for my setup, I find that not to be the case. 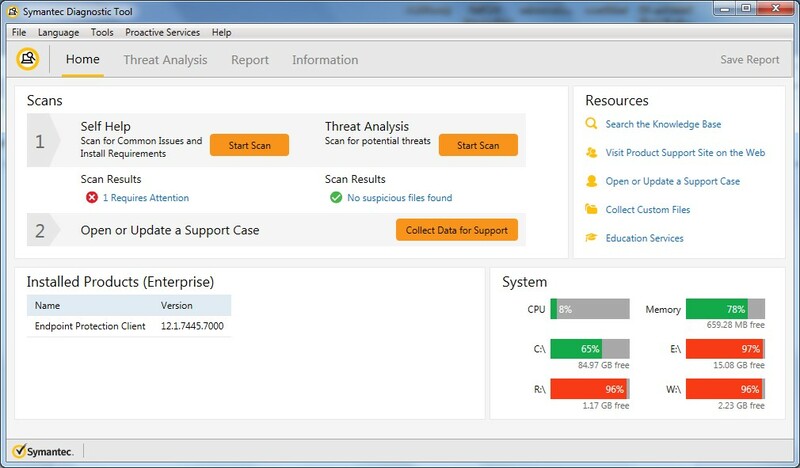 The main reason I chose SEP Enterprise vs. the similar consumer equivalent Norton Internet Security suite was due to the ability to manage network connected client internet security and client connected appliance security features on my connected laptop clients. Though this is an enterprise endpoint security product, the client side can be installed as a stand-alone unmanaged client that allows the client administrator to control most if not all of the anti-virus, anti-malware & firewall security settings. Unfortunately, the client side connected appliance security (i.e USB, CD, DVD, etc.) connection policies are only available if the client is set up a a managed client, not an unmanaged one. Not all security suites do this anyway so no real loss here. As an unmanaged client though, SEP performance is quite similar to if not exactly the same as Norton Internet Security. And SEP’s cost per license is comparable to if not less than Norton’s if you get the 3 year support option (~ $32.50 per/yr/license). I also perform monthly manual scans using these other free products: Malwarebytes, Windows Defender (auto scan disabled), Norton Power Eraser, Microsoft Safety Scanner (thank you kindly Patch-Lady) & Symantec’s Diagnostic Scan Tool. I do this just before performing monthly full system backups. 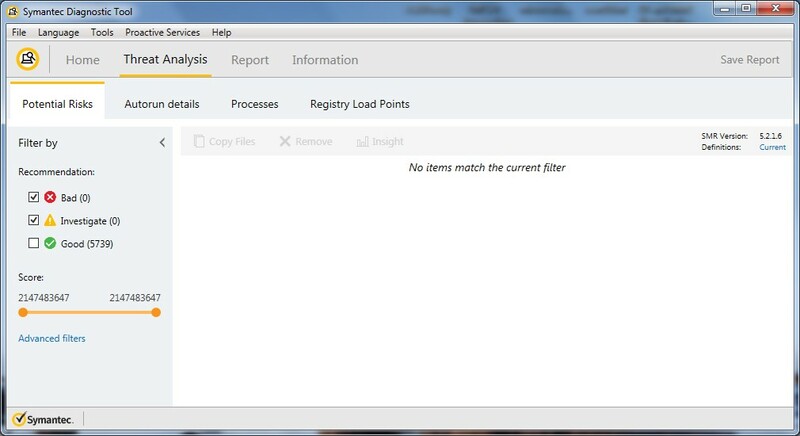 Except for an occasional “PUP” detected by Malwarebytes (must be those occasional hacking sites I download from), the rest of the scans come up … Good-To-Go nothing found. 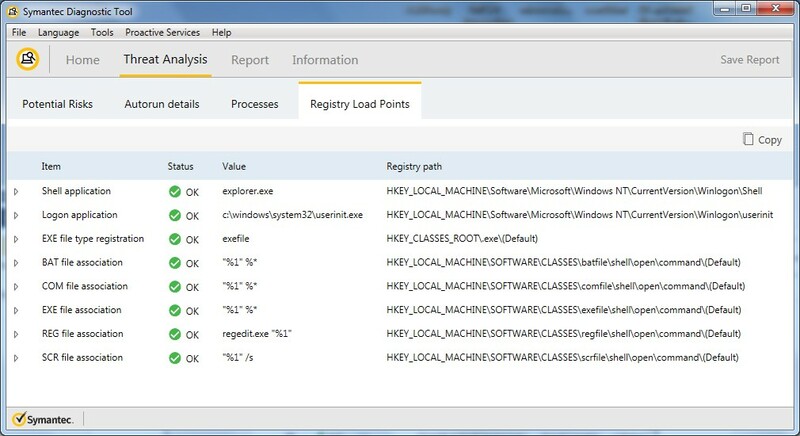 The Symantec Diagnostic Tool (SymDiag.exe) is mainly a support tool to verify & detect system issues that may prevent SEP or other Symantec products from installing on your system. If SEP or other Symantec products are installed, it verifies installation integrity and displays problems if any are found. 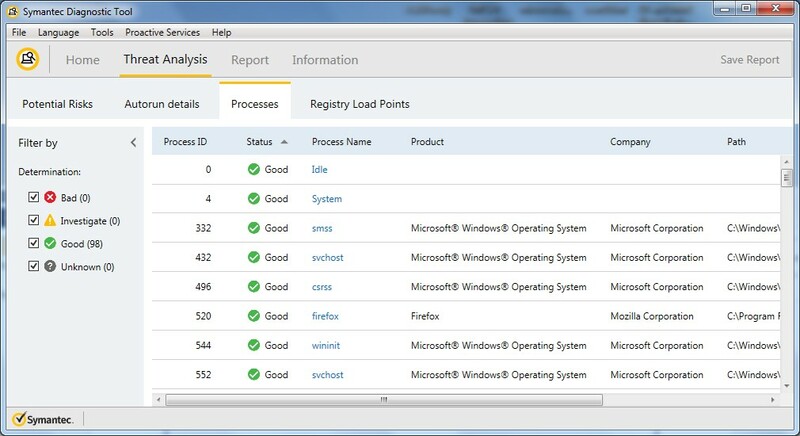 However, SymDiag can also perform a complete & thorough threat scan of your entire system and generates / displays several scan report results. It does need internet connectivity to Symantec’s online file reputation database to validate the file hashes it collects/generates. 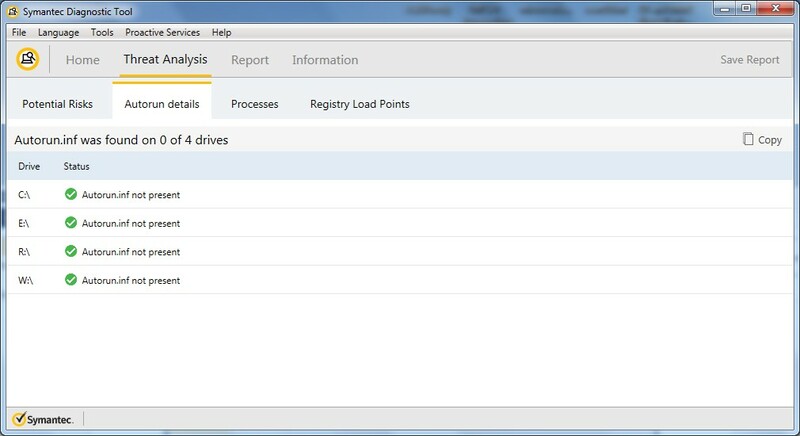 It runs relatively quickly but dependent upon your system, it may take 5-15 min, more if you scan every file on every active drive/partition within your system when you perform the scan. I don’t know if it has the ability to scan network connected drives (i.e. NAS) as I don’t have one and I haven’t used the tool to scan files through the network on network connected clients as I prefer to do this locally on the client – it may work but I’ve never done it. But, the best part … it’s a totally free download from Symantec. I would definitely consider adding this to your free anti-virus/anti-malware manual scan tools tool chest. 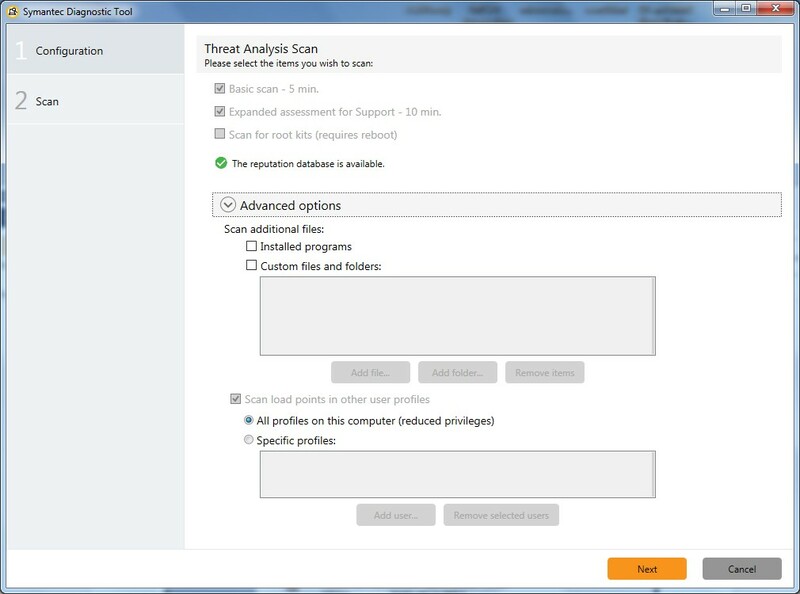 I’m not sure if the threat scan function is available if you don’t have SEP or another Symantec product installed. If any of you try this out, please reply so that I and others know – thanks. By the way, SEP is available for Linux & Mac too though not sure about the SymDiag tool. Does this mean that Avast recognizes MS Updates as Malware ? Starting to look like the old hobbyist’s are coming back with their custom built computer’s. Citing Wikipedia : “As of Jan 2018 Windows XP holds 3.36% of the whole windows market, meaning it has 2.8% of the desk top operating system market share. Other estimates are as high as 4.05%.” Would be interesting to here from some of those folks on how they keep it running safely. Maybe an XP users forum and a windows 7 forum after it runs out. Kamer Kaan Avdan has come out with a redesigned XP called “Windows XP 2018 Edition. ” He has the video on You Tube. Ask Woody might want to do a review. Seems, this is like Classic Shell which brings the classic Win 7 UI to the hybridized Win 8.1 and Win 10. ___ Classic Shell for Win 10 is no longer supported by the author because of the crazy workload from Win 10’s rapid twice-a-year upgrades. Will this also befall “Win XP 2018”? I have AVG Internet Security (paid for), on Monday 21st Windows 10 upgrade 1803 failed on my Acer Z3, exactly as described above . Tried all the usual recovery options, Startup repair, restore, repair install – all failed using any of the 3 options. Reinstalled Win 10 1709 and upgraded to 1803 without issues; re-installed all other apps, back to normal. I actually believe its M$ ridiculous upgrade process for all these update problems. Its an ill-conceived process that needs re-design otherwise it will drive users away – some I know have gone back to Win 7. Not all users are tech savvy and take system images every so often; Windows.old is just unsatisfactory. Our computer also did this Windows 10 auto update – a long overnight process (annoying!) – and, alas, we now have the blue screen of death. It asks to choose the keyboard, then gives options, none of which work. A remote session with Microsoft chat had me download the previous version of Windows, not telling me that a “clean install” would lose everything. Then, after waiting yet again overnight while this downloaded onto another laptop so that I could move it onto a USB stick, and then to the doomed computer, the steps given did not work. Thankfully though since we do not want to lose all files and more. Now, another call to Microsoft, frustrating at that to try to reach a live person, has her quoting a planned speech that they are working on a “fix” which could take FIFTEEN TO TWENTY DAYS!!!!! In the meantime, I am supposed to just sit pretty and wait. The other option is to do a clean install and lose everything. I told her another option is to go with Mac/Apple! I asked her how many millions this has affected and whether Microsoft is sending out free computers to all of us. She claimed it’s not millions and to just watch for the email or news update. I asked, “on what?” (tongue in cheek) since the computer is the blue screen of death. Sad piece of work. Now, I see all of these posts about the many problems with Windows 10 updates in 2018. Great.